Alfie the rabbit loves fruit and vegetables. He likes nothing more than munching on a carrot for a healthy snack during the day! He also loves to do puzzles - crosswords are his favourite. He's set a crossword for you to do, and all the answers are fruit and vegetables. Use the clues to help you. Good luck! 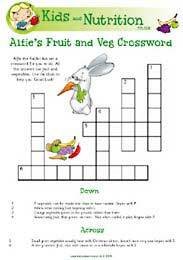 Why not Download Alfie's Fruit and Veg Crossword and see if you can solve the puzzle.